A versatile footballer from Bendigo League club Golden Square, Ross Ousley was still a teenager when he played his first senior match for the Blues in 1956. Over the next three seasons, he racked up 23 games and 15 goals, before crossing to the VFA and becoming one of the stars of the competition – at first with Port Melbourne, then later with Northcote. Carlton’s recruiters were drawn to Ousley throughout the youngster’s fine season for Golden Square in 1955. Equipped with pace, courage and sure hands, he had emerged as a rangy ruck-rover for the Bulldogs, who surprisingly didn’t stand in his way when his clearance to Carlton was negotiated. 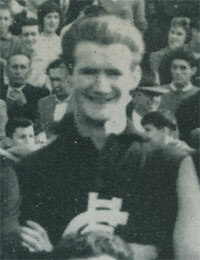 By the start of the 1956 pre-season practice matches, Ross was at Princes Park - wearing guernsey number 33, and showing real aptitude as a fast-leading forward with Carlton Reserves. Although the Blues began the year with two heavy losses, the team recovered to post six wins in succession, and by mid-season the boys from Princes Park were definite finals contenders. In round 6, Ousley was promoted to the seniors for the first time, warming the bench at Punt Road as 19th man until late in the last quarter against Richmond, and enjoying a six-goal win. It was a similar scenario the following round. The Blues got home by one point over Footscray at the Western Oval, while Ross sat wrapped in a dressing gown until deep into the last term. Returned to the Reserves for a month after that, he didn’t make the senior team again until round 12, when Carlton played host to Essendon at Princes Park, and Ousley was named in the starting line-up at full-forward. In the first few minutes of that match, Ross kicked his first career goal off the ground in Carlton’s goal-square, and followed up with a second later in proceedings. After his team won by 40 points, coach Jim Francis singled out his young spearhead for particular praise, noting his tireless leading and good aerial skills. Consequently, Ousley stayed at full-forward for six successive weeks - booting 10 goals, 18 behinds - and therein lay a problem. Although his all-round ability was certainly adequate, the length and accuracy of his set-shot kicking for goal was not. In the return match against Richmond at Princes Park in round 17, Ousley was held scoreless and a woefully inaccurate Carlton side scored 7.24 (66) to the Tigers’ 10.11 (71) – bringing to and end Ross’s tenure at full-forward. Despite that set-back, Ousley persisted, and over 1957-58 elbowed his way back into the senior side to play a further 15 games. Most effective in the centre, he was also a capable stand-in key forward or flanker, and a popular clubman. He wore the white CFC monogram on his chest for the last time in round 14, 1958, when Carlton travelled to Geelong and handed the Cats a 16-point defeat at Kardinia Park; winding up his VFL career having played in 15 wins during his 23 matches. In 1959 Ousley transferred to VFA front-runners Port Melbourne, where he was asked to shore up their defence at full-back and was something of a revelation. But the Borough were in the midst of a form slump, and after just two seasons, Ross headed back across town and signed to play with Northcote. Languishing in 2nd Division, the Brickfielders were hell-bent on promotion and saw Ousley’s versatility as a crucial factor in their resurgence. And that is exactly how things panned out. Playing mainly in the centre, but influential anywhere on the field, Ross had a stellar year for the Green and Gold. They lost only twice in a season that culminated in a famous 15-point Grand Final victory over Dandenong, and heralded Northcote’s return to the top echelon of the Association. In 1962, Ousley was appointed captain of Northcote, and led them through their first two seasons back in First Division. Ross had his mum to thank for his swift clearance to Carlton in 1956. Golden Square had a ruling that Melbourne clubs had to pay for clearances. Mrs. Ousley fronted Golden Square's committee and told them, "My son is better off in Melbourne." "He has a good job in Melbourne - and nothing here." Golden Square then relented. A relieved Carlton secretary Colin Prosser said "Mrs. Ousley certainly came to the rescue for us. Young Ross is a definite prospect. He starred at centre half forward in the last practice game, kicking well with both feet." Contributors to this page: blueycarlton , PatsFitztrick , molsey , Bombasheldon , tmd1 , true_blue24 , p(12)terg , Jarusa and admin . Page last modified on Friday 09 of December, 2011 11:57:18 AEDT by blueycarlton. 1975 State Game - Jezza Vs Marlarkey. 2002 - Brent Heaver article (6/3/02).